There were two events recently that made me quite concerned. First, I was looking through some of the results from the Dromaeo test suite and I noticed a bunch of zero millisecond times being returned from tests. This was quite odd since the tests should’ve taken, at least, a couple milliseconds to run and getting consistent times of “0” is rather infeasible, especially for non-trivial code. Second, I was running some performance tests, on Internet Explorer, in the SlickSpeed selector test suite and noticed the result times drastically fluctuating. When trying to figure out if changes that you’ve made are beneficial, or not, it’s incredibly difficult to have the times constantly shifting by 15 – 60ms every page reload. The exact syntax differs but the crux of the matter is that they’re querying the Date object for the current time, in milliseconds, and finding the difference to get to total run time of the test. To better understand the results I was getting I built a little tool that runs a number of tests: Running an empty function, looping 10,000 times, querying and looping over a couple thousand divs, and finally looping over and modifying those divs. I ran all of these tests back-t0-back and constructed a histogram of the results. The results here are terrific: There’s some clumping around 0ms (with some results spread to 1-4ms – which is to be expected) and a bunch of normal-looking distributions for each of the browsers at around 7ms, 13ms, and 22ms. This is exactly what we should expect, nothing out of the ordinary taking place. Huh. The results are much stranger here. There aren’t any, immediately, pretty clumps of results. It looks like Firefox 3 and Chrome both have a nice distribution tucked in there amongst the other results, but it isn’t completely obvious. 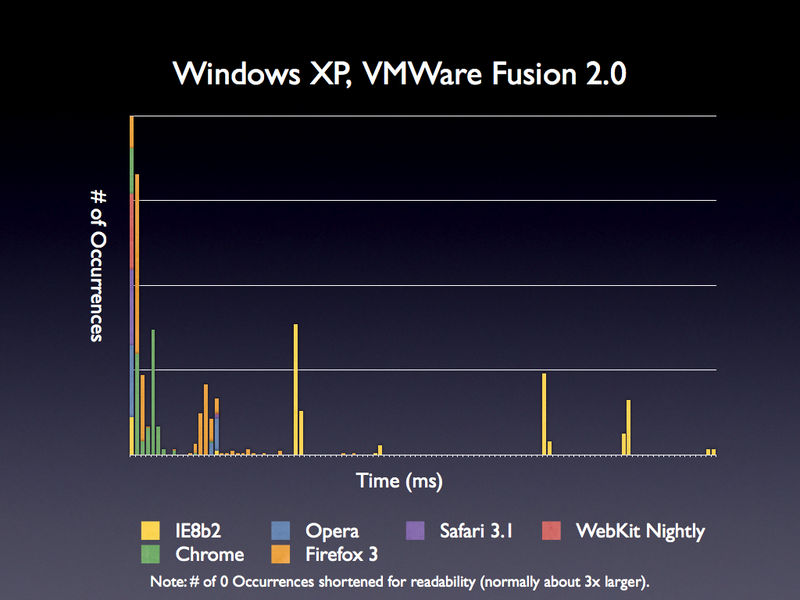 What would happen if we removed those two browsers to see what the distribution looked like? Wow. And there it is! Internet Explorer 8 (I also tested 6, for good measure, with the same results), Opera, Safari, and WebKit Nightly all bin their results. 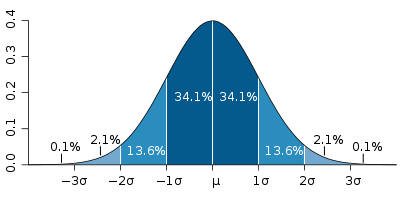 There is no ‘normal distribution’ whatsoever. 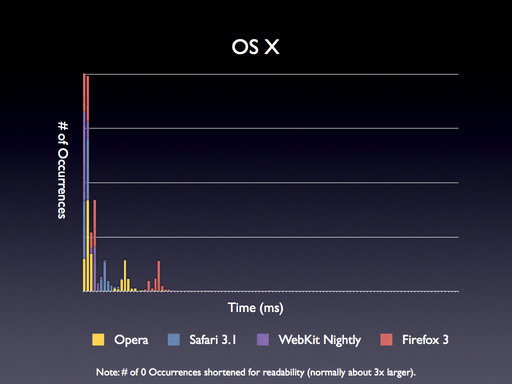 Effectively these browsers are only updating their internal getTime representations every 15 milliseconds. This means that if you attempt to query for an updated time it’ll always be rounded down to the last time the timer was updated (which, on average, will have been about 7.5 milliseconds ago). Nope, the results are the same as using the VM. Any test that takes less than 15ms will always round down to 0ms in these browsers. It becomes impossible to determine how much time the tests are taking with consistently zeroed out results. The error rate for any test run in these browsers would be huge. If you had a simple test that ran in under 15ms the error rate would be a whopping 50-750%! You would need to have tests running for, at least, 750ms before you could safely reduce the error overhead of the browser to 1%. That’s insane, to say the least. What test suites are affected by this? Nearly all of the major ones. SunSpider, Dromaeo, and SlickSpeed are all predominantly populated by tests that’ll be dramatically effected by the error rate presented by these browser timers. All of this research still left me in a rough place, though. While I now knew why I was getting bad results in Dromaeo I had no solution for getting stable times in Internet Explorer. I did a little digging, tried a couple more solutions, and stumbled across ies4osx. Ies4osx is a copy of Internet Explorer 6 running in Wine, running in X11, on OS X. It works ‘ok’, although I’ve been able to get it crash every so often. Disregarding that, though, it’s stable enough to do testing on. ies4osx provides some surprisingly stable results – we even have something that looks like a normal distribution! This is completely unlike the normal version of IE 6/8 running on Windows. It’s pretty obvious that the Wine layer is tapping into some higher-quality timer mechanism and is providing it to IE – giving us a result that is even more accurate than what the browser normally provides. 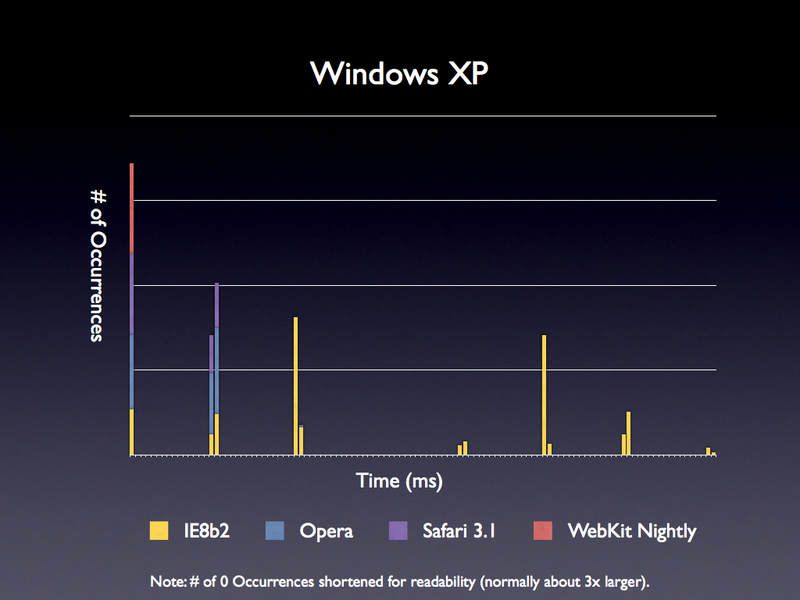 This is fantastic and it’s dramatically changed my personal performance testing of Internet Explorer. While I’m not keen on using anything less than “IE running on XP with no VM” for actual testing – this layer of higher-detailed numbers has become invaluable for testing the quality of specific methods or routines in IE. Update: I’ve put the raw data up on Google Spreadsheets if you’re interested in seeing the full breakdown. 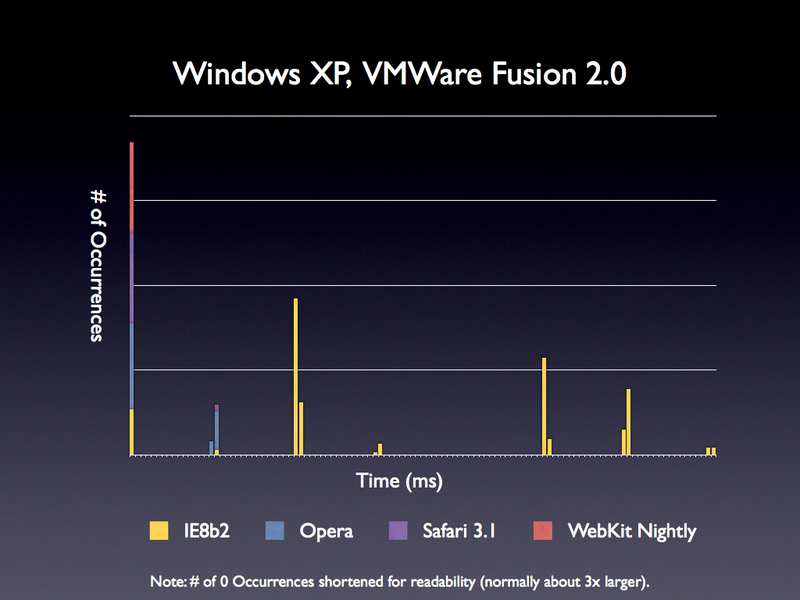 Wow, it’s very surprising seeing how IE6 through Wine is giving you better distributed results. I would of expected just as bad, if not worse deviations from a normal distribution. AFAICT, the proposal doesn’t address the need for actually getting a precise time though, but they seem related. @Elijah: Yeah, I was quite surprised, as well. @Kris: Yeah, it seems more related to having highly-accurate timers (not to be confused with high-precision Date/getTime, which is what I’m discussing here). High precision timers would be absolutely wonderful and would solve a number of the problems that I outlined above (although it wouldn’t fix anything for the older browsers, such as IE6). Wow. Great Article. This sort of blows away a lot of the “X library is faster than Y library” because of Z test results. I’ve always been skeptical of SlickSpeed-like results…especially when reported in comments, threads, etc. Now it’s time to factor out the XP bias. I wonder if Vista has the same issues. John, fascinating stuff. I wonder if this problem is limited to XP only. Did you also try Vista? Thanks for the link to ies4osx by the way. I had no idea that existed. High resolution timer APIs are available on Windows – it’s just a matter of browser vendors to actually take advantage of those APIs to retrieve the times more accurtely. @Rich Strahl: It appears as if, at least, Firefox and Chrome are taking advantage of these higher resolution timers – at least it isn’t a complete wash. I consider this to be very critical, especially since so many developers write tests not even realizing that these issues could occur in the first place. I’m not sure if it would work for your purposes, but you could potentially call a Flash method to get the current timestamp instead of the JS (new Date).getTime() approach and see if the results are any better. I have no idea about the overhead incurred by such a call, though. Do the interval or timeout functions rely on the same internals as date’s getTime()? Are they prone to the same “clumping”? @Artur Janc: That’s certainly a possibility. Amusingly, though – how would you measure the overhead of performing those calls without a working time method? I assume you’d be forced to do some intensive level of calls just to get by. @Mr Speaker: Not exactly. Timers (setTimeout and setInterval) have their own sets of rules which I’ve written about before. 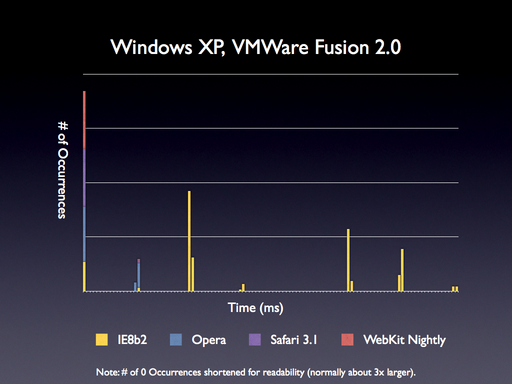 I went ahead and ran your test page on Safari 3.1, IE7 Firefox 3 and Chrome on Vista (64-bit) and saw the same results. 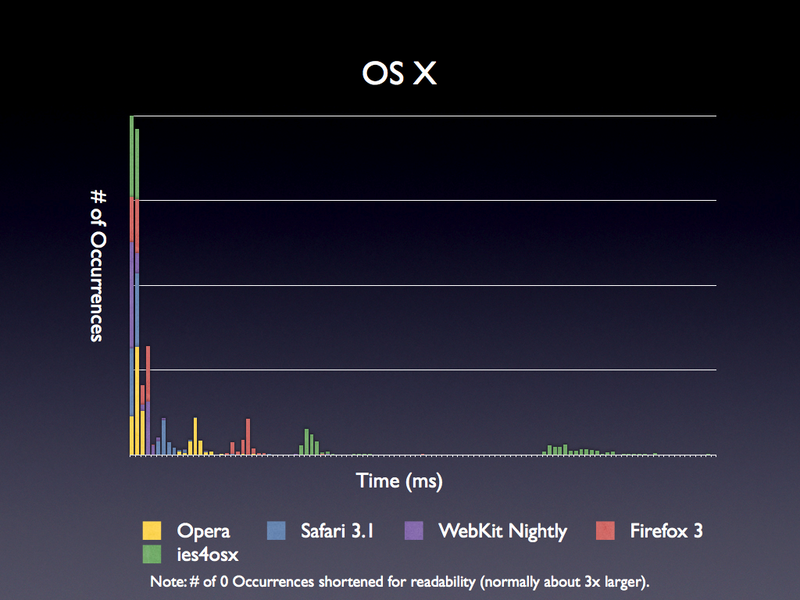 Safari actually had all 400 results end up in the 0ms bucket! 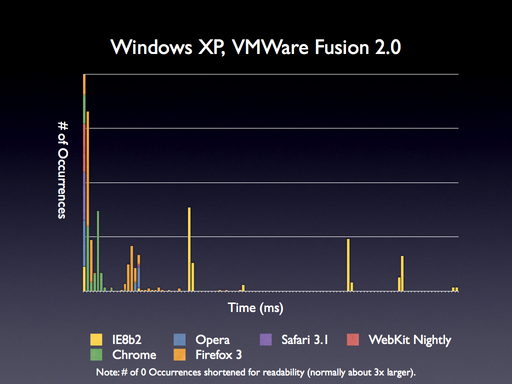 Also, Firefox and Chrome show similar results as in XP; they seem to be using more accurate time APIs. @Matt Pennig: Thanks a ton for running those numbers, I really appreciate it. 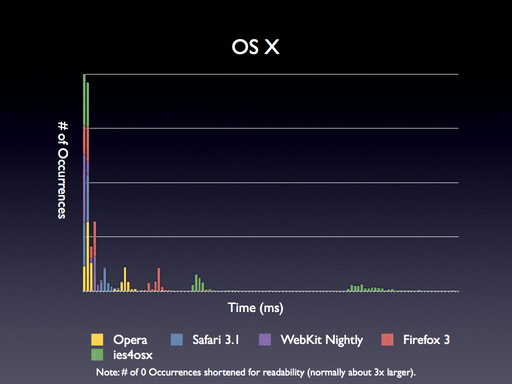 I had seen WebKit nightly hit all 400 within the 0ms bucket but it’s interesting to see regular Safari make it. I imagine that it’s largely dependent upon the speed of the machine, in this case. @Ernie Bello: Thanks for the raw data! Yeah, that’s exactly what I was seeing, as well. Ok, I’m both happy (that my tests seem to be working) and sad (that my code is still affected) to see this continue to propagate to the new version of the operating system. I think you would be interested in bug 363258 (https://bugzilla.mozilla.org/show_bug.cgi?id=363258 ). In short, the internal windows clock only updates every 10 (XP Home?) or 15ms which is the interrupt rate for the PIC timer. You can force this to be faster but it eats up to 25% more battery life. Firefox 3 (and apparently Chrome? I should look.) use a more complicated method to overcome this limitation. Firefox 3.1b2pre nightly x86-64 build by Makoto on Vista64. Have you tried finding a slower processor to run the tests on? That might help some with granularity issues. Ideally you could just set the multiplier lower, as in power saving mode of a modern processor. Using an older architecture processor might not be able to take advantage of low level optimizations in current browsers. (In Java, the API is called System.nanoTime()). The reason Windows offers 15-16ms resolution timers and nanosecond resolution timers is because the coarser resolution is much less expensive to query. Ideally browsers would implement a cross-browser function for getting higher resolution results and still leave you the option of the coarse resolution API for when you don’t need high resolution. This behavior is also seen in many platforms running on Windows and is not specific to browsers (as it’s specific to the underlying system calls used by the higher level systems/platforms). Look up GetTickCount in Wikipedia. There’s the cause of the low resolution. I realise that communication with this plugin would have a speed impact, but if the speed impact is constant, that’d be fine for comparison of two pieces of code on the same browser. John, great post and timely too. The idea is pretty simple: tests are run in multiple passes, starting with a modest 10x iteration. If that takes longer than 500ms (and it usually does), the next passes uses an iteration count extrapolated from the results of the first. This is repeated until the test takes > 500ms. This typically takes 2-3 passes at most. Each pass is run by a setTimeout, which allows the browser to garbage collect, re-render the DOM, and clear the “script is taking too long” timer. In my experience, time difference are not rounded down. Sometimes when something only takes a few ms you can get a result of 15ms. It just depends if there has been a tick during the test or not. These ticks occur once every 15/16ms. So if you measure a test that takes around 1ms a 1000 times, and sum the results, you will get an accurate result. where the form have 2 component: a WebBrowser and a richTextBox. I’ve noticed the 15ms precision in the time (WinXP). To minimize the problem, I run a test multiple times so the total takes 5-10 seconds and then divide by the number of times to get an average time to run one test. But yes, this is an issue of using the wrong OS timer in Windows. Having the benchmarks run for a certain amount of time (1s) and counting the number of iterations seems to be a good way to deal with this problem. Also, “higher is besser” is a better way to interpret benchmarks. Years ago I wrote a short article about precision timing after coming across this problem (http://gpwiki.org/index.php/VB:Timers). It’s like Jerky (et al) said, in Windows the most commonly-used timer is ticked every 15.625ms. There’s a way around that, even with the aforementioned getTickCount API call. The workaround was pretty darned obscure at the time I wrote the article. To get an idea of overhead associated with wine, you should install a windows build of firefox 3 so that runs through wine. Nice results, but I’m having trouble reading the bar charts. Would you consider switching to alternating (“striped”) bar charts or multi-level charts instead? If you’re really keen on getting good results in IE, write an ActiveX control that exposes QueryPerformanceCounter (http://msdn.microsoft.com/en-us/library/ms644904.aspx) – QPC’s accuracy is around the 1ms range I believe. If you want even *more* accurate results, set your boot option to limit to one processor, so you don’t have to worry about SMP timer inaccuracy. Actually, the times for a test shouldn’t be normally distributed. They should be a shift of the distribution for the lag introduced (shifted by the time the test “actually” takes). The thing with lag is that it can’t be normally distributed. Say your lag has a mean of 2ms. If it were normally distributed, then your 5ms lags would occur as often as your -1ms lags. But of course there are no negative lags. It’s worth it to do a bit of thinking about what the lag distribution really looks like, and what the sources of lag are. You mention context switching, but other sources of lag could be cache misses and branch mispredictions, as well as GC in the browser. There are probably others too. Figuring out what the actual distribution of lag is could be a nice Masters thesis, if no one has done it yet. That said, if you’re adding up and averaging to get the times you’re graphing, then by the Central Limit Theorem you’ll do OK by pretending the result is normal. And of course all of the above assumes that you’re perfectly timing the tests. In practice, you aren’t (not least because of the 1ms accuracy of Date() even in the best case). I suspect your timing effects have more of an impact on the observed distribution than any aspect of the test itself. There is one little trick you can try with Windows. Open Windows Media Player. Now re-run the tests. You don’t have to play anything either, just keep the main window up. Windows Media Player makes some calls to change scheduling behavior to a much lower latency model in Windows. This trick is commonly used to run game servers on Windows. 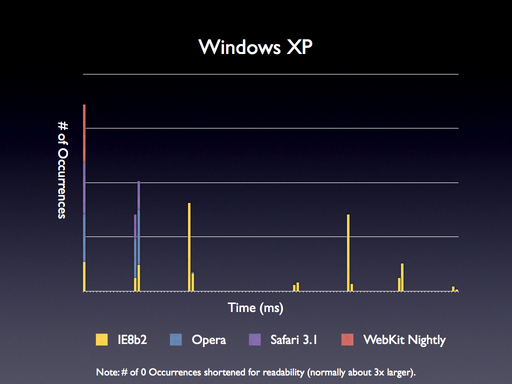 I don’t think it will help with Window’s 10ms regular timer granularity, but its worth trying anyway. It’s almost always a good idea to calibrate your benchmark to run for a certain amount of time and typically repeat it for a minimum number of times (Unless you want to measure the performance of a “cold” VM). Even if we would have more accurate hardware based timers, this would be a good idea, because the less often you make a call to the timer function the less you influence your test. Hardware based timers have usually their own problems, such as for example not being in sync on different cores of a multicore cpu. While everyone here is talking about the content of this post, no one sees the real problem. That my claims Statistics have no place in a coding curriculum at a college are hugely wrong and unfounded. Nice one, Resig. :) On the bright side, at least I finally know how a normal distribution fits into my unit testing. Looks like I am going to be retaking a certain class. Any action plan to fix Dromeao and Sunspider? Good to see performance tests being showed using normal distribution. This is not actually the first time I’ve seen an underlying improvement in Wine’s implementation of Win32 bubble up to a browser – last check Safari for Windows passes more of the jQuery test suite when run on Wine than when run on Windows proper. nice results John! I have noticed this in the past as well, however, repeating a single test and averaging the results will approach the same distribution as non-windows tests will it not? It’s normal situation. I’ve been tracking some CSS/JS performance tests for a year and there are a lot of issues with ’rounding’ timer. Safari under Windows also shows close picture. I think the only solution is to run dozens of tests and take an average. There are couple of math theorems that proving that with enough numbers of tests a statistical error will be small for every kind of distribution (‘big numbers law’). P.S. John, Paralles has recently lauched new version of their solution for running Windows on Mac with dozens of new features. @roon: The timing is of course going to depend on what kind of API the kernel provides. If the timing API is passing through to a high resolution timer from the underlying kernel on OS X doesn’t mean that it does the same thing on the ReactOS kernel. I used browsershots to get screenshots of the results from your little tool. Hope it helps. Great tests! I have been testing the speed of of my jQuery scripts for about a year now, testing individual querys to make sure I am acessing the DOM as quickly as possible… I came across 0ms a bunch of times too, and also found that anything under 20-30ms was extremely unreliable so this explains a lot! Actually this is an issue with the System timer, i doubt any browser can be any more accurate than the timer libraries built into the OS. The first number is the actual latency, Chrome varies from 0-4 when idle. The one in green is the average FPS for the last n seconds, configurable in realtime, and the last is the actual fps based on the latency. It operates in two modes, this is the cpu heavy one which I recently implemented. I noticed that Chrome in beta was giving me upwards of 500+ fps and went down drastically since the official release. I have factored in my framework almost doubling in size since I initially implemented the statistics, but all the other browsers have maintained their FPS or improved it. IE 6 and Opera 8 ran about 64 fps, but since installing IE8 (I never used 7) it’s gone down by about 33% to 40+%.